The Intercontinental Hotel in Double Bay is the epitome of luxury, as a five star hotel, with a stellar rooftop and rooms to match it sits in one of Sydney’s flashiest suburbs. The complex is home to many a restaurant including the recently launched Mr G’s, a New York Bar & Grill. 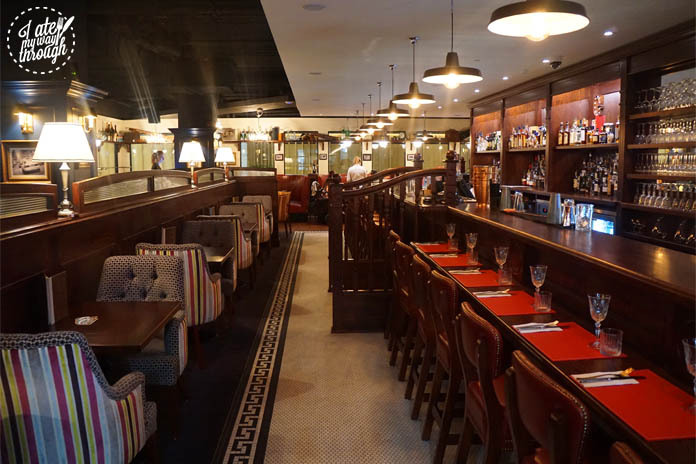 The restaurant boasts an authentic American charcoal grill, which it uses to cook all of its meat helping to produce perfectly cooked meat, and create that enchanting mouth-watering juiciness across its selection of steaks. 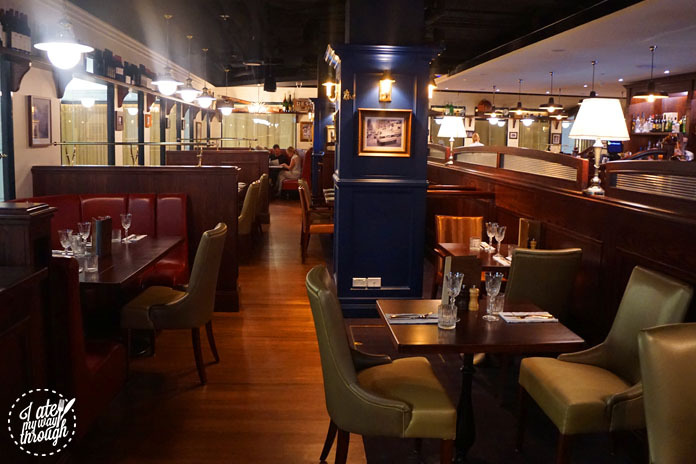 The room evokes a classic New York steakhouse, with its distinctive styling and unique atmosphere. It instantly transports you from sunny Sydney to an old world New York feel, where businessmen would have smoked cigars, drank whiskey and talked shop. This is made even more possible by the impressive scotch & whisky list the restaurant holds in its possession, with over 100 different varieties ranging from classics to rare pours. Heavy timber panels line the wall, whilst intimate booths dot the room upholstered with cushiony leather. The impressive high topped bar is the perfect place to enjoy a pre-dinner drink, perhaps one of their many amazing whisky infused cocktails by bartender Doug Laming. To begin we opted for a cocktail from their inventive and fun list of humorously named tipples. The Koko-mo ($21) was a rum based cocktail of beauty. With Mt Gay Barrel Rum, salted pineapple caramel, pineapple & lime juice and marshmallow foam, it was lip smashingly delightful. 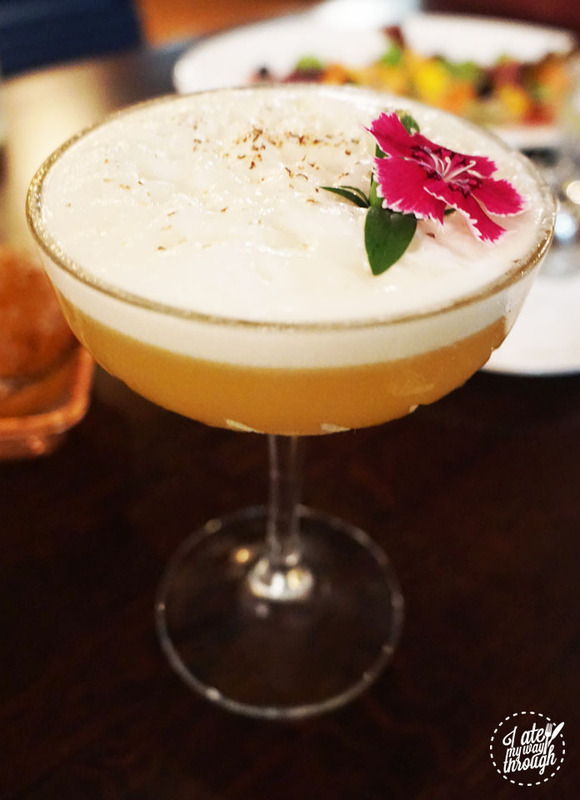 Fruity and light, it tasted like a tropical holiday in your mouth, with the sweet addition of the thick marshmallow foam creating an indulgent finish. Obama-licious ($21) is a whisky based cocktail, bringing to the forefront the marvellous menu selection and the skills of their bartender. 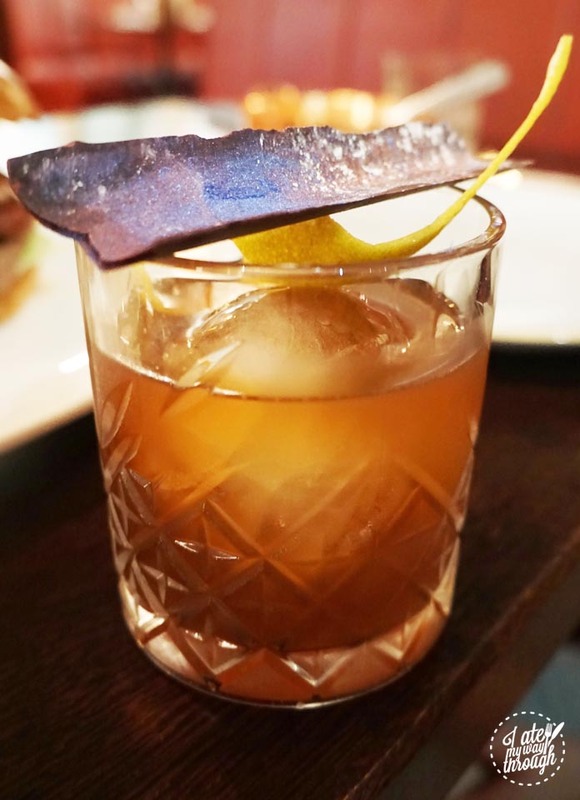 With a base of King’s Country chocolate whisky, Amaro Montenegro, rye whisky, Fee Bro’s black walnut bitters, electric acid wash and chocolate, it may sound heavy but is really in fact delicious and easy to drink. An overall well balanced cocktail with slight smoky notes yielding from the whisky & bitters unifying with sweet elements to create a fabulous alliance. It sits comfortably in its tumbler with the garnish of vibrantly coloured dark chocolate shard finishing it off perfectly. The waitress explained the menu to us and recommended she bring some cornbread to start. If there is a time to indulge in bread and butter, this is it! Named on the menu as Damn Good Corn Bread ($4), damn bloody good it is! A gorgeous mini loaf came out alongside a gleaming silver butter holder home to some bacon butter. 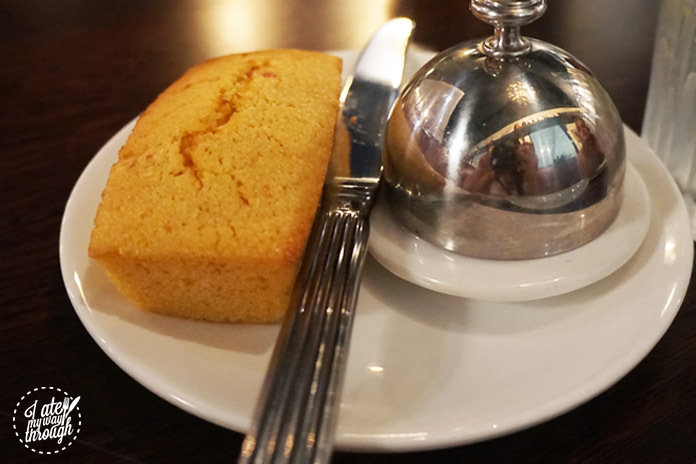 Infused with flavours of chilli and maple syrup, the chef’s worked tirelessly trial-and-error testing the recipe to come up with the best corn bread you’ll probably ever eat! Baked daily and warmed in their oven, steam erupted as we broke it open and it crumbled gorgeously on the plate. Already we were off to a great start! From the Appetisers & Salads we opted for the Beef Carpaccio ($24) and King Crab Sliders (3pc, $24). A generous portion of paper thin sliced raw beef sat in a carefully constructed rectangle. 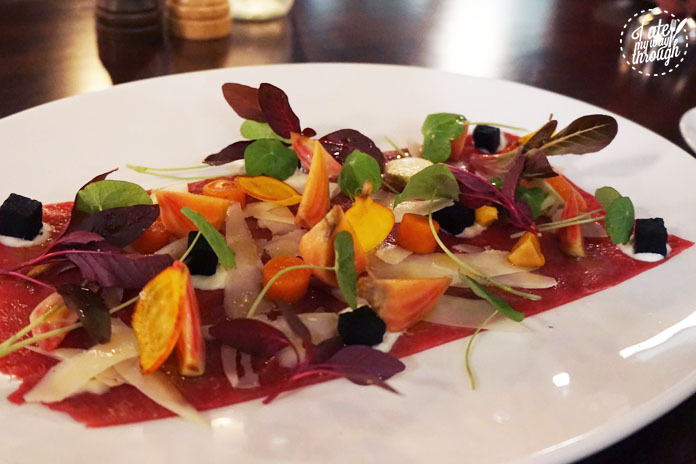 It was adorned gorgeously with summer pickled vegetables, which looked like jewels crowning the plate ever alongside shaved parmesan, truffle oil and rosemary salt. Who knew meat could look so pretty? It was a nice, light dish, and a good prelude to those wanting to go heavy in the mains, however it seemed to be lacking some zing or kick. Perhaps more truffle notes, salt or even a hint of spice, would have helped the meat to jump off the plate a little more and shine on our tastebuds. 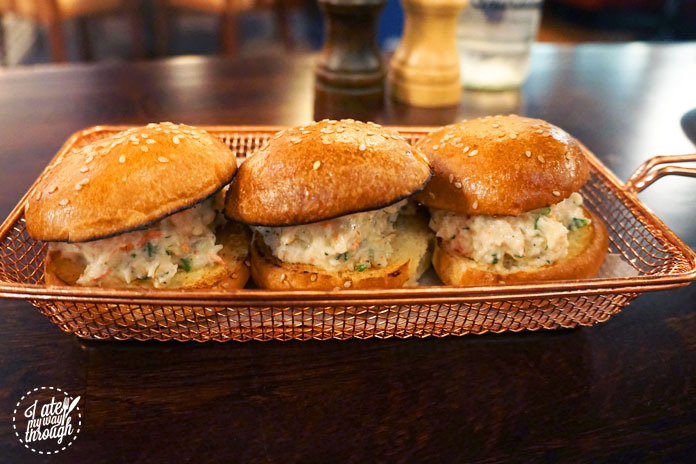 The King Crab Sliders sounded too good to pass. I’m a sucker for sliders (really who isn’t) and I was excited to see what these little babies would be like! Three mini golden brioche buns were toasted to a comforting warmth, filled with crab meat, cucumber, celery and lemon aioli. The refreshing seafood combination with creamy aioli paired together gloriously, with the added texture of the crunchy cucumber and celery delivering the perfect bun filler. The centrepiece of the menu is obviously their steaks which are “Hot Off the Coals”; they are charred, smoked and roasted in their unique charcoal & wood-fired oven without the use of gas or electricity (impressive right!). Diners can choose from the Grain Fed ($36-$90) or Pasture Fed ($35-$110) selection, which are served with potato gratin and your choice of sauce or butter. The sauces are all homemade with Chimichurri, Mushroom, Béarnaise, their house specialty of Armagnac & Pepper whilst the butters include Black Garlic Butter or Bacon Butter. We choose the new menu addition of the Short Rib 400g ($38) hailing from Angus beef, Cape Byron NSW. I was sceptical in this choice, thinking we should have ordered a classic steak however following the waitress’s advice, we were utterly blown away! 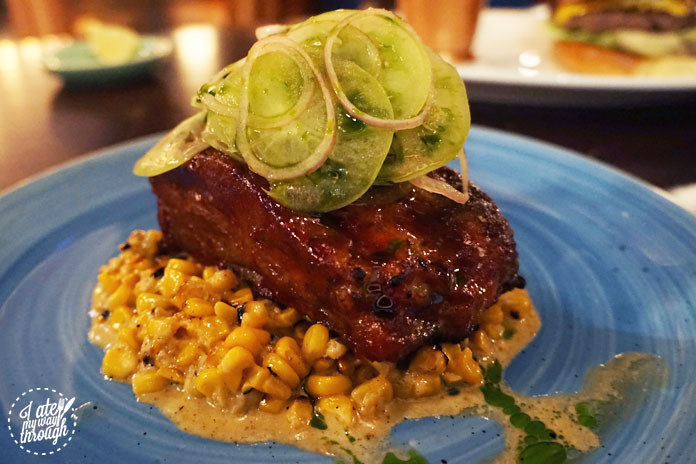 Covered in a sticky glaze of chilli & miso rub, the meat sat on a bed of sweet creamed corn. The short rib was cooked to utter excellence as it fell apart effortlessly, disintegrating into juicy bits of meat and fatty goodness thanks to their charcoal grill. The sweet glaze encasing the meat was mouth-watering with the lush bed of corn underneath, all offset by the refreshing pickled green tomato which helped to cut through all the richness. This dish was outstanding and proved our favourite of the evening! The other main was the Wagyu Burger ($29). 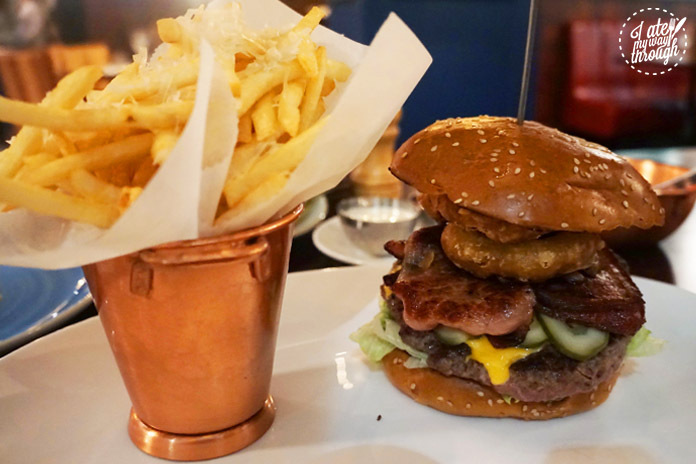 Sydney’s burger game is high at the moment, as a never ending competition of the best and most extravagant burger one can find. Described as NY style, the lightly toasted bun was home to lettuce, American cheddar, maple bacon, pickles, Gallagher’s special sauce & fries. It looked impressive, piled high, even containing some battered onion rings to get your heart racing, but it fell short. 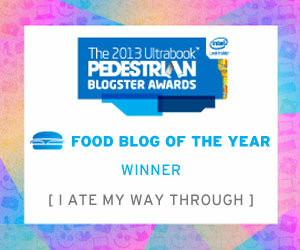 The meat was flavourless, the cheese tasted bland, and it failed to live up to expectations. The maple bacon and pickles were executed well, but sadly overall it was lacking. The two sides of Herbed Carrots ($9) and Creamed corn ($9) helped to keep us a little bit healthy. The creamed corn was next level incredible. 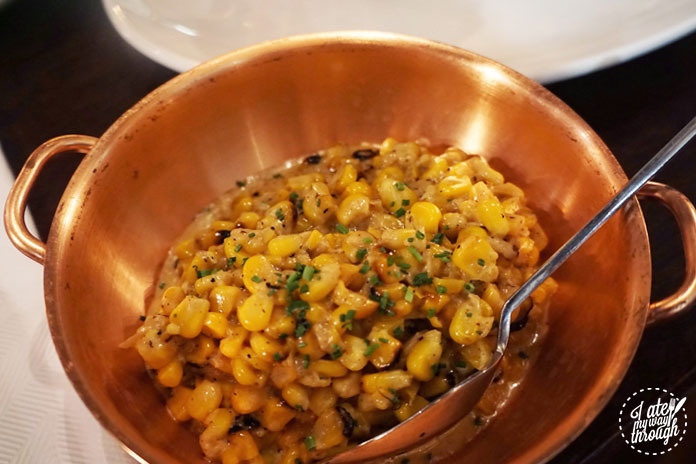 Juicy, buttery corn in a creamy mixture, sitting in a shining brass dish that screamed flavour. It was moreish and addictively good, however probably not the best side to order given it was also the accompaniment for the amazing beef short rib above. 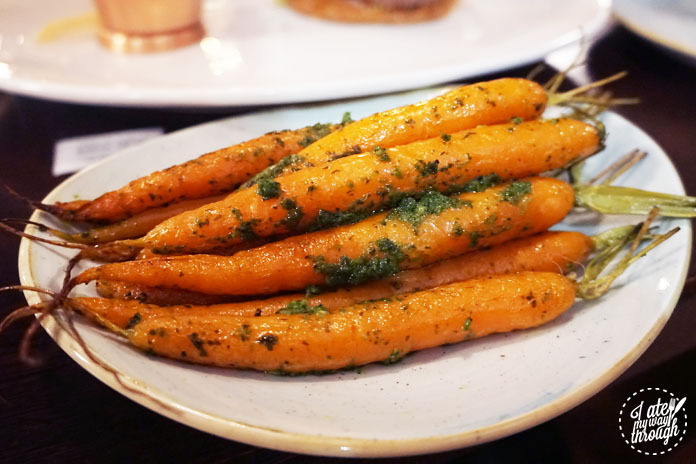 The carrots looked picture perfect, however were a tad over cooked. I love a light crunch but these were way too soft, whilst the herb crust just seemed to be an adaption of the chimichurri sauce, that fell short on the flavour front. The humorously named cocktails continue with Boston’s Tea Party ($23) to finish. Containing Japanese whisky Nikka from the Barrel, apple infused Calvados, rye whisky, lemon juice, egg white, gomme syrup and matcha foam this was an interesting one. 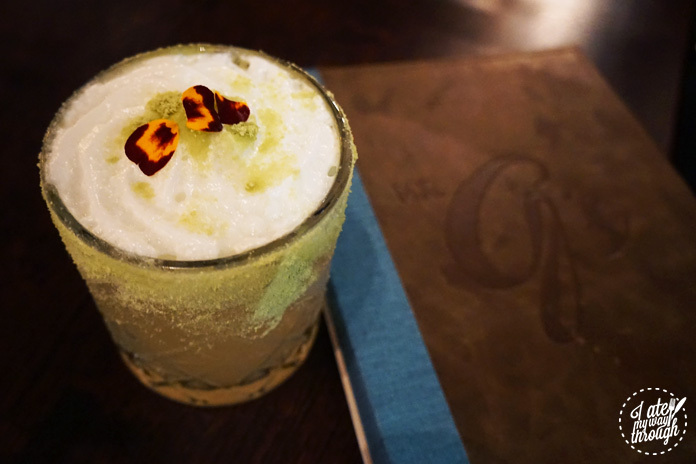 Kind of like a whisky sour but not really, I couldn’t really work out if the matcha foam worked or not. However, it was pretty as a picture so we were happy! For dessert, whilst a chocolate lover the American Fudge Brownie ($16) did tease me, but instead we opted for something a little lighter. 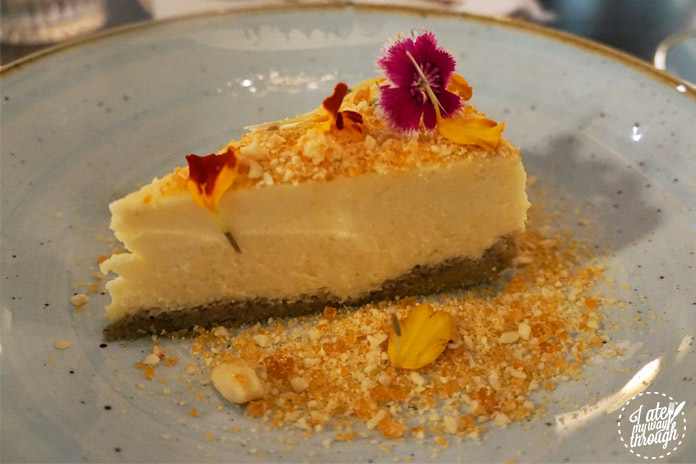 The NY Baked Cheesecake ($18) was a beautiful dish decorated with sweet crumbs and flowers. I liked the cheese mix which was a lovely texture proving not too light but not too dense- brilliantly composed. 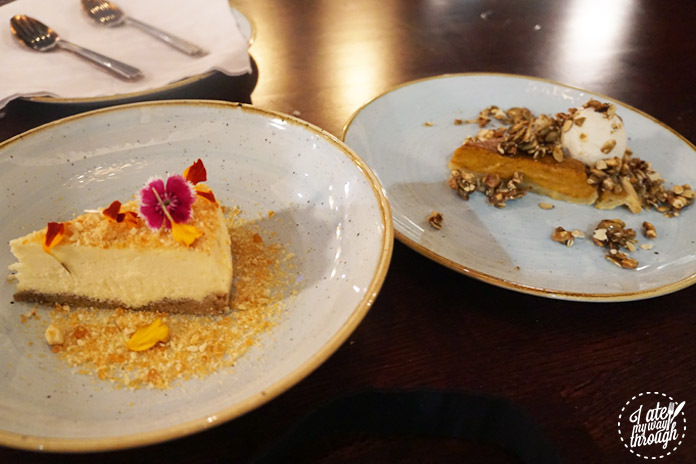 Meanwhile the A Little Pumpkin Pie ($18) with a graham cracker crust, smooth spiced pumpkin custard and delicious vanilla ice cream, did the American’s proud. 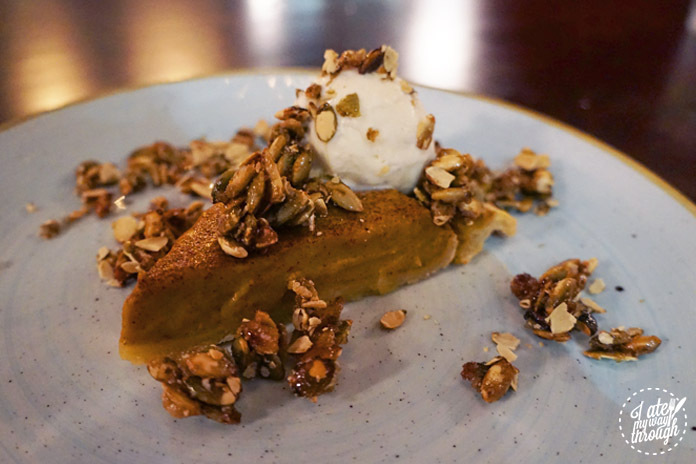 Pumpkin pie is hard to find in Australia, yet this was a pleasant adaption. The pumpkin custard was tasty, presenting a good choice for those after something that isn’t too sweet! The plate was decorated with caramelised pepitas, adding a nice crunch but often accompanied by unwelcome bursts of saltiness. If you’re after a delicious dinner where meat and charcoal are at the forefront then Mr G’s is for you. The newest and classiest establishment in one of Sydney’s premier suburbs will carry you to another world of delicious old world glamour.